TOKYO, Japan, September 5, 2015 (ENS) – On Saturday, Naraha became the first town to allow evacuated residents to return after an earthquake and tsunami damaged the nearby Fukushima Daiichi nuclear power plant more than four years ago. The accident caused a meltdown in two of the plant’s six reactors that released radiation over a wide area. The entire area of Naraha falls within the 20 kilometer exclusion zone imposed by the Japanese government around the stricken Fukushima Daiichi power plant. About 100 people, including government officials, attended a ceremony in Naraha Saturday to pray for the town’s recovery. 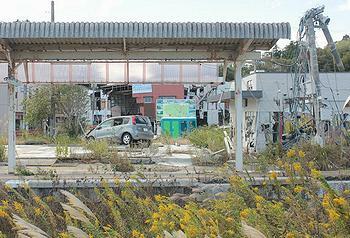 Naraha Mayor Yukiei Matsumoto said he will work with residents to rebuild Naraha. Officials unveiled a plan for a “compact community,” where medical facilities, shops and housing will be concentrated into a small area. The mayor and a group of children planted a tree symbolizing the town’s rebirth, and three young students read their essays about their delight in returning home. Naraha’s official registered population numbered 7,368 residing in 2,694 households as of this week, but the town was completely abandoned following the Fukushima Daiichi disaster. The “Japan Times” reports that according to a survey by the government and others, about 46 percent of the residents hope to return. A medical clinic in the town is set to reopen in October, while a new clinic is scheduled to be built starting in February. To address worries about radiation, dosimeters will be handed out to returning residents and 24-hour monitoring will be ongoing at a water filtration plant. Household tap water will be tested upon request. The Japanese government ordered seven municipalities near the Fukushima Daiichi plant to be completely evacuated soon after the March, 2011 disaster. Naraha is the first of the municipalities to have had the evacuation order lifted. On August 1, 2012 the government eased the restriction order by allowing residents to visit their homes during daylight hours, but not permitting overnight stays. In March 2014, Naraha completed decontamination work in its residential areas, although radiation levels remained high in some areas of the town, and many buildings were still in ruins. By April 2015, residents could stay overnight if they applied for permission, and the evacuation order was lifted completely on September 4. But problems at the nuclear power plant are ongoing as the Tokyo Electric Power Company, TEPCO, struggles to decommission the site of the world’s second worst nuclear disaster after Chernobyl. TEPCO has created a subsidiary dedicated to tackling those challenges. President of the Fukushima Daiichi Decommissioning Company, nuclear engineer Naohiro Masuda, told an NHK interviewer in March that Fukushima Daiichi still generates more than 300 tons of radioactive water every day. He discussed his plan to build a massive ice wall around the plant to stop any more groundwater getting in and becoming contaminated. Some experts have questioned whether that will work. Masuda told NHK interviewer Yoichiro Tateiwa that he is confident it will work. 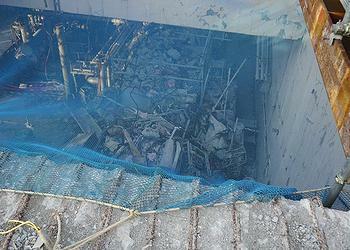 Masuda says nuclear engineers have finished the removal of spent fuel from the damaged No.4 reactor building. The next step is to remove spent fuel from the No.3 reactor building. Masuda says radiation in some areas of the crippled reactor buildings is still so high that workers can only stay there for a few minutes. The most difficult part of decommissioning the plant will be removing the fuel that has cooled and turned into highly radioactive debris.